The present portrait dates from the period when Van Dyck was based in Antwerp from 1627 to 1632, between his trip to Italy and his second, final trip to England. Among all the genres in which the artist worked, it was portraiture that brought Van Dyck the most esteem and in which he produced his greatest achievements. Van Dyck’s formulas in this genre were already fully developed in his Genoese period, and in his portraits of Genoese aristocrats he replaced the spontaneity of his earlier images of Flemish clients with a presentation in which the elegance, refinement and slim carriage of his sitters established a model that Van Dyck would take to its extremes of perfection during his second period in England. Depicted individually or as pairs, these images, which are extremely carefully devised with regard to the composition and poses, are based on the artist’s skilled draughtsmanship. They use long, elegant proportions for the figures that convey an air of refinement and delicacy. 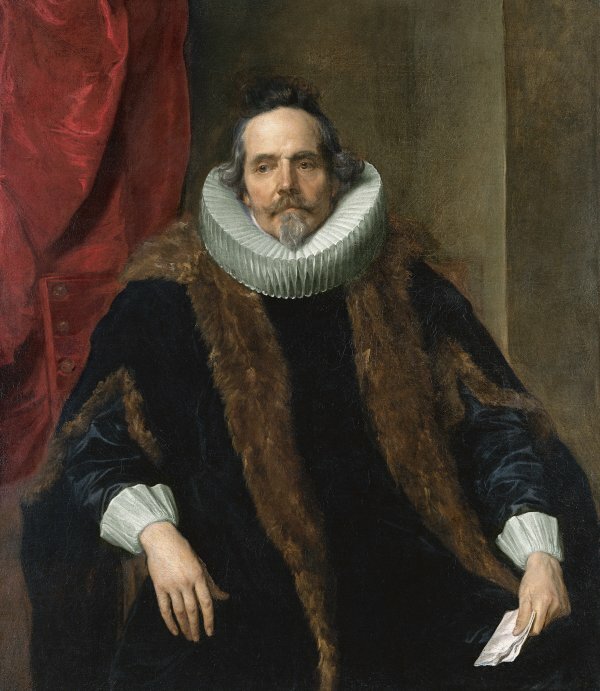 Van Dyck was able to depict even his least attractive sitters with beauty and grace while retaining a physical lifelikeness, an ability that was highly appreciated in the court circles in which he worked. This aspect of his style on occasions led to the criticism of flattery on the artist’s part towards his distinguished clients, although it is also true that some of his patrons complained that he did not make them look attractive enough. Jacques Le Roy was a high-ranking official in the Spanish government of the Netherlands. He occupied an important position in military administration and was a member of the Brabant Chamber of Commerce, first as a councillor then as president in 1632. One year prior to the execution of this portrait Le Roy obtained the title and estate of Herbaix. The sitter in the present painting was identified on the basis of a print after the portrait by Adriaen Lommelin. The print has an inscription at the bottom edge that provides the name of the sitter, enumerates some of his virtues and gives the date of Van Dyck’s painting. It was published by Gillis Hendricx in 1654 and again in 1759. In the print, the figure of the sitter is reversed, the background simplified and a coat-of-arms added at the upper left corner. In addition, the head is presented more frontally in the print while it is also possible to see the breeches of the suit and one stocking, elements that are difficult to discern in the painting due to the tonality of this area and the fact that the pigments have darkened over time. The present portrait has features characteristic of Van Dyck’s second Antwerp period in which his art reflected the influence of his trip to Italy. The manner in which the sitter is located and the distinguished pose that places all the emphasis on the head and hands recall Genoese works by the artist. The ample red curtain on the left that acts as a backdrop and contrasts with the strong red of the chair on which Le Roy is seated was also a device used by the painter during his Italian period. Van Dyck also executed full-length portraits of Le Roy’s son, Philippe and of Philippe’s future wife Marie de Raet. They date from the same period as the present canvas and are now in the Wallace Collection, London. This fact has led to the suggestion that it was Philippe who commissioned the portrait of his father from Van Dyck, a suggestion made by Göpel and published by Ebbinge Wubben. Given that Philippe Le Roy was illegitimate, the fact that there is no known female pair to the present work reinforces the idea that he commissioned the three portraits. The present painting was acquired from the J. & S. Goldschmidt gallery for the Thyssen-Bornemisza collection prior to 1930. The first known reference to the canvas dates to 1791 when it was auctioned in Antwerp from the Peytier collection in Merchten. The painting was in the UK, with the London dealer William Buchanan, from where it was acquired by John Cust, 2nd Baron Brownlow, and was passed down through that family until it was sold by the 6th Baron in 1929. While in the UK it was exhibited at the British Institution in 1829 and at the Royal Academy of Arts in 1893. An old copy of this canvas is in the Musée de Beaux-Arts in Valenciennes.